If you follow me on Instagram (and if you don’t, why not?!! click here) then you would have seen a few pics featuring Bumble and Bumble’s Don’t Blow It (H)air Styler. This is truly my holy grail hair product! The majority of the time, I don’t blow dry my hair. Firstly, I don’t really have the time or patience to blow dry it properly, and secondly, now that I have lightened my hair significantly, my hair is not in any shape to be subjected to heat on a regular basis. However, my hair, which is super fine, with a bit of a curl (in parts only), and prone to frizz, means that if I let it air dry, I invariably end up putting it into a pony so that it looks half way decent. When visiting Mecca recently, the sales assistant was putting out Don’t Blow It, and mentioned it to me saying that even though she had only been using it for a few days, she was calling it a miracle product. Sucked in by the sales pitch, I bought the little travel sized tube to give it a try. And you know what, it may have been a sales pitch, but she was right – this is a miracle cream, and I have since gone on to buy the full size! So simple to use, you simply wash your hair, then a apply a dollop (I use about a 20c piece) through out your hair, including the roots, then let air dry. You can tousle or twirl to bring out more of a curl, you can brush through for a straighter finish, and you can layer with other products like surf spray for even more effects. If you head to B & B’s site, they have a number of video tutes showing different effects. The first pic shows it brushed through after applying for a straighter effect. It gives my hair that “cool French girl” kind of vibe – that textured, slightly dishevelled but still put together look! I simply washed my hair, towel dried, applied the styler throughout the hair, and combed through. Once dried, I combed through again, adding a touch of Kerastase Elixir The Imperial oil to the ends. These two pics show the effect when I want to embrace my waves. The pic on the left was achieved by applying the Don’t Blow It to towel dried hair, combing through, then giving my hair a good allover spray with Pureology’s Sea Kissed texturiser, their salt-free version of a surf spray. A quick scrunch with my hands, then I left my hair to dry. Once dry, I gave my hair one more quick tousle with my fingers, especially in the root section, as otherwise I find you can see the product there, almost like you put hair gel in. Once tousled, it disappears completely. The pic on the right takes a little bit of pre-planning, if you are like me and your hair takes forever to dry. I washed my hair at night instead, towel dried, applied styler throughout and then put my hair into four even plaits. When I got up the next morning, I simply undid the plaits, and gently broke up the hair with my fingers – do not brush! Again, a tiny bit of Kerastase oil on the ends. These curls come out looking so pretty, and lasted all day. 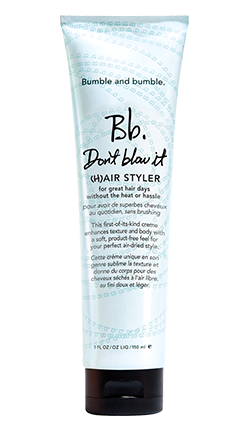 The best way to describe Don’t Blow It is like a light leave in conditioner, with a touch of styling hold. It gives my hair just the right amount of weight to hold frizz at bay, without weighing down my hair at all. Most important, it does not leave your hair feeling sticky or crunchy, my two big bug bears with leave in products. The fragrance is fresh but very light – TBH once applied, my shampoo scent still takes over, so it is probably safe for even those who a fragrance sensitive. I can’t speak for how this would work on some one with thick hair, but for fine haired ladies like myself, this product is truly a godsend, and I highly recommend it! Disclaimer: This is not a sponsored post – all products mentioned have been purchased by me.